If you are looking for information on the FreshBerry franchise business opportunity, FreshBerry franchises or FreshBerry franchising, then you have come to the right place. FreshBerry Frozen Yogurt Café was founded by David and Camille Rutkauskas in 2007. The Rutkauskas', having a pulse for their customer's desire for a guiltless treat, and simplicity of menu choice, created a new restaurant concept to deliver just that. Whether it is self-serve, full-serve or kiosk, FreshBerry has a store model for every style and budget. FreshBerry starts with the proprietary yogurt that is exclusive to FreshBerry. Whether you choose our signature FreshBerry tart or our Decadent Dark Chocolate, our exclusive frozen yogurts are scrumptious - over 25 toppings are available from fresh fruits and cereals to candies and nuts. Hundreds of refreshing combinations to tantalize your taste buds! Our yogurts contain live active cultures which may help to support the body's natural immune and digestive systems. The menu also features fruit and yogurt smoothies with an ample choice of fresh fruits including strawberry, blueberry, raspberry, blackberry, kiwi, pineapple, mango, and coconut. Additional highlights are FreshPops - exclusive to FreshBerry, these frozen yogurt pops are available in an assortment of fruits and are made with our signature FreshBerry yogurt. With many toppings to choose from, this is a menu with mass appeal at a price point that encourages repeat business for all dayparts! FreshBerry is the future of frozen yogurt! The brand takes root in everything from photography to uniforms to the interior decor. Our professional brand advertising ensures that everything about FreshBerry stays true to the concept. All franchisees have easy access to store decor items, menus, signage options, fixtures, point of sale as well as direct mail and local store marketing programs and materials. A Franchisee's success is a FreshBerry success and we're behind our partners every step of the way! This contemporary-urban style frozen yogurt cafe is a great fit for local colleges, thriving business districts, metropolitan retail centers, office parks or heavily concentrated neighborhoods. The store footprint is approximately 800 to 1200 square feet, with seating for 15 to 30 guests. The relaxing atmosphere and delicious menu means FreshBerry will appeal to a wide range of customers. With such a small real estate footprint, FreshBerry has a low start-up cost. 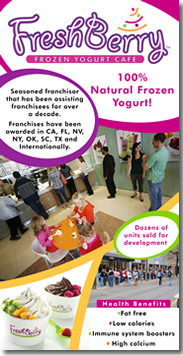 Franchisees of FreshBerry have access to continual support within the franchise system. 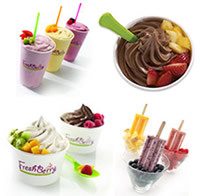 The founders of FreshBerry have surrounded themselves with talented team members who guide each franchisee through the steps of opening a successful restaurant franchise - from selecting prime real estate locations, to architectural design, store décor, product purchasing and comprehensive hands-on training. System consistency is monitored regularly by trained operations staff, helping franchisees increase their operational efficiency and profits. Quality is a priority at FreshBerry, not only in their products and concept, but in service and support for franchisees as well FreshBerry is truly unique in its level of commitment to all who join the team! "We looked into many, if not all, of the chain frozen yogurt concepts before we signed up with FreshBerry. We previously owned an independent frozen yogurt business, yet we chose to franchise with FreshBerry because of it's strong management team, the quality of the product and the look and feel of the store. Our sales have far exceeded our expectations and we are eager to open additional locations ASAP."